Wright Brothers Day is a United States national observance that was established in 1959 by President Dwight D. Esienhower. It is observed on December 17. Wright Brothers Day commemorates the first successful flight of the Wright Flyer I, heavier-than-air powered aircraft built by Orville and Wilbur Wright. It took place on December 17, 1903, near Kill Devil Hills, North Carolina. The Wright brothers became interested in flying in early childhood, when their father bought them a toy helicopter. They liked the toy so much that when it broke, they built their own. In the late 19th century they came up with the idea of three-axis control which made it possible for the pilot to maintain the aircraft's equilibrium and to steer it effectively. Orville and Wilbur Wright used this principle to design and build a series of manned gliders. 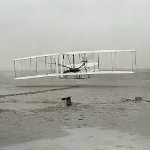 Their experience testing gliders helped them create the Flyer (which is now referred to as the Wright Flyer, Flyer I or 1903 Flyer). It was made from spruce, a strong and lightweight wood. They made their first attempt at powered flight on December 14, 1903, but it was unsuccessful. Repairs took three days. On December 17, the brothers made another attempt with Orville piloting the Flyer. The brothers made another three flights that day, taking turns. This event is an important milestone in the development of aeronautics, no wonder its anniversary is celebrated as a national observance.